Strong letterforms are essential for legibility, endurance and beauty—particularly when applied to a three dimensional form. Those forms begin first with the two dimensional design. Janey will show some of the process and the results using layouts of selected projects and a slide presentation of carved work. Janey will also have slides and discussion of two large stone sculpture projects to be installed in 2019. Janey has been a Colleagues of Calligraphy member since 1979. Her calligraphy led to the study of medieval manuscripts, carving letters in many different kinds of stone, relief carving and stone sculpture. She has carved Roman letters, Japanese, Hebrew and Norse runes. She teaches letter carving and sculpting at the Indiana Limestone Symposium almost every June. 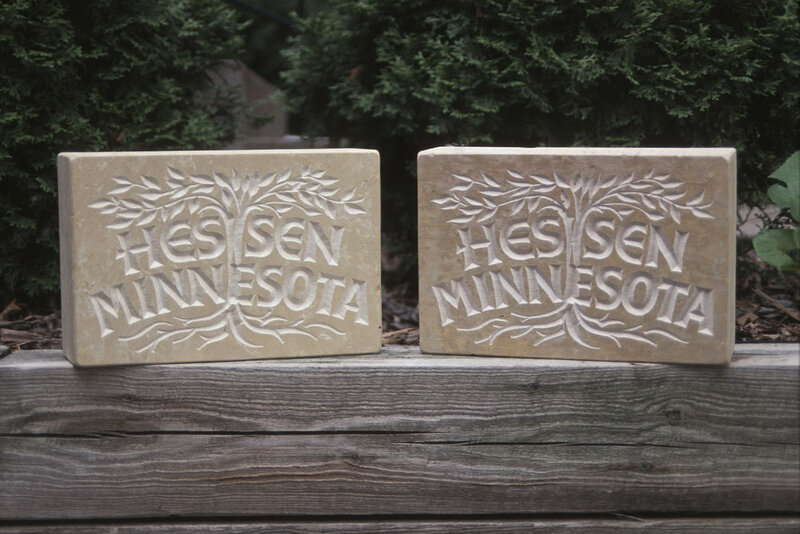 Janey has a home studio in Edina, Paper & Stone, and is currently working on a whimsical limestone bench sculpture for the Edina Community Library. It will have quite a bit of carved letters on it, as well as critters enjoying some books. Alex Glowka will treat us to what he calls his “beveled stuff”. Uncover the mystery with us! Kris MacDonald: Celtic Calligraphy—Try Your Hand!